After the horrific shootings at an elementary school in Newtown, Conn., a year ago claimed the lives of 20 children and six adults, there was a sense in the country – especially among gun-control supporters – that the tragedy would be different from similar ones in the past and push the nation to action. But ultimately, a sustained change in public opinion did not materialize, and a bill to tighten gun laws died in the Senate. The idea that Newtown might lead to a sea change in public opinion on gun control had some basis in a Pew Research Center survey conducted less than a week after the shootings. About half of Americans (49%) said it was more important to control gun ownership while 42% said it was more important to protect the right of Americans to own guns. Although the numbers added up to just a modest change, it was the first time during Barack Obama’s presidency that more Americans came down on the side of making gun control the priority. Another survey conducted right after the shootings found that Americans viewed Newtown differently than they did the movie theater shootings in Aurora, Colo., in 2012 that left 12 dead and the Jan. 2011 Tucson, Ariz., shootings that killed six people and seriously wounded former Rep. Gabrielle Giffords and 13 others. After Newtown, 47% of those surveyed said that the shootings reflected broader problems in American society, while 44% believed they were isolated acts of troubled individuals. In the two other mass shooting incidents, the public largely viewed them as isolated acts. But later that month, the Senate bill on background checks went down to defeat when advocates couldn’t muster the 60 votes necessary to pass it. 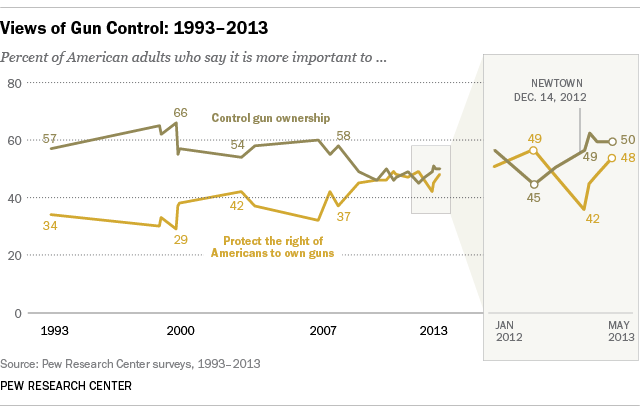 And in May, the overall trend on whether it was more important to control gun ownership or protect gun rights edged back in the direction of gun rights. Why did the gun bill fail after Newtown? Pew Research’s poll in May, after the defeat, still found wide support for the idea of expanded background checks — 81% favored them, with nearly equal levels of support from Democrats and Republicans. But the specific bill put forward in the Senate by West Virginia Democrat Joe Manchin and Pennsylvania Republican Pat Toomey was more divisive. While 81% of Republicans favored expanding background checks, just 57% supported the bill. Many of those who had reservations about the bill expressed concerns that it included other restrictions about background checks, or would lead to a “slippery slope” toward more government power. Also at play was the greater political involvement of conservative Republicans and gun owners who prioritized protecting gun rights. A quarter of those who prioritized gun rights said they had given money to an organization taking a position on the issue and 12% of them had done so in the previous six months. By comparison, just 6% of those prioritizing gun control had donated to a group, with only 3% doing so in the previous six months. Conservative Republicans are also more likely to base their vote on where a candidate stands on gun policy. While only 36% of Americans overall said they would not vote for a candidate who disagrees with them on gun policy even if the candidate agreed with them on most other issues, that share rises to 47% for conservative Republicans. The percentage is smaller for liberal Democrats (37%) and conservative/moderate Democrats (31%). By the same token, 52% of gun owners who prioritize gun rights would not vote for a candidate who disagreed with them on the issue. A smaller number of non-gun owners (33%) said they would not vote for a candidate who disagreed with them on gun policy.